James Fielding died seven years after his wife, on January 14, 1847. He was 64 years old. Solomon Winslow Ingham (1812 – 1901) – S. W. Ingham was born on February 9, 1812 in Cayuga County, NY. On his sixth birthday, in 1818 his family moved from New York to Fayette County, Indiana. His father died in 1820. He married Lydia Ann Gadd of Shelby County, Indiana in 1836. Solomon and Lydia had two sons and five daughters. He entered the ministry with the Methodist Episcopal Church two years after he married, about 1838. In 1841 he came to Iowa as a circuit rider preacher. He was one of the organizing members of the First Iowa Conference of the ME Church. His circuit covered a distance of over four hundred miles. He started Methodist Church Societies at Quasqueton, Waterloo, Ankeny, Bradford, Traer, Cedar Rapids and many other locations. His wife, Lydia, died in 1847. In 1848 he married Rebecca Husband, who became the mother of three children, all died in infancy. Rebecca died shortly after the birth of her third child. In 1854 Solomon married Cynthia Taylor and had four additional children. Cynthia died in 1893. Solomon W. Ingham died on February 16, 1901. Jesse Fielding (1817 – 1850) – Jesse Fielding was born on Feb. 7, 1817 in England, the son of James and Sarah Fielding. He married Sarah Butterworth on June 11, 1838. Jesse and his brother came to America about 1843, leaving his wife and son behind. He settled on Shaw’s Forks near Ellisville, IL. In the fall of 1844 he wrote his wife to come in the spring, giving directions for the trip, telling her to come via New Orleans by boat. Sarah and her son Edward set sail on February 11, 1845 from Liverpool and arrived safely in Illinois after a long voyage. Jesse built a small two room house on forty acres. Two daughters, Sarah Ann and Mary Ellen were born in Illinois. On July 27, 1850, Jess went after a load of wood and before starting for home went in to bathe at “Cedar Creek near the ford”. He had a cramp in a deep water hole and drowned. Someone came by and found his team tied close by and discovered his body. His wife, Sarah, was waiting dinner for him when she received the sad news. They had intended to a Baptist Church meeting that evening. Sarah married Andrew Maholland on July 17, 1851. Jesse’s son Edward served in the Civil War, Company C, 59th Illinois Inf., and died at the Battle of Kennesaw Mountain. 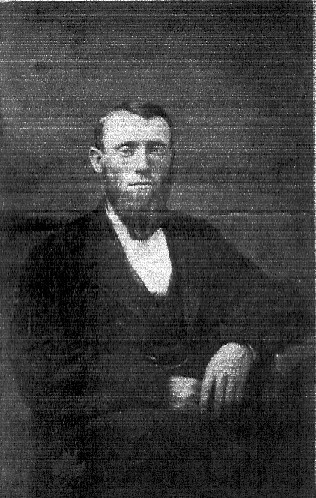 Levi L. Goodell (1840 – 1923) – Levi Goodell, the son of Samuel and Sarah “Sally” (Brown) Goodell, was born on June 22, 1840, in Ellisville, Fulton County, Illinois. In the Civil War he served in Company D, 55th Illinois Infantry as a Sergeant. He was in battles at Shiloh, Chattanooga and Chickamauga and marched with General Sherman to the sea. He took part in the Grand Review in Washington, DC at the end of the Civil War. He married Sarah Ann Fielding on December 31, 1865. Sarah and Levi had six children. They resided in Prairie City, IL for two years and then moved to Piatt County, IL. Levi built a one-room house that was added on to throughout the years and farmed 120 acres. About 1898 they moved to Humboldt County, Iowa. Levi and Sarah were active Christians. Sarah writes, “two months after marriage we were both converted in an old log schoolhouse, called Buckeye. Before we came away there was a Christian Church erected near. Trustees were Levi Goodell, Elijah White, and Jose Keller.” “Somewhere in the year 1877 a church was organized S. W. 4 miles. A great revival followed – a good strong membership – Bethel Church. And so the children were taken in or most of them baptized and began an open Christian life and very many happy seasons are clustered around it.” Levi Goodell died on September 26, 1923. Sarah Ann Fielding Goodell (1847 – 1928) – Sarah Ann Fielding, daughter of Jesse and Sarah (Butterworth) Fielding, was born on September 22, 1847. Sarah’s written history provides much of the source of information on the Fielding and Goodell families. She married Levi Goodell on December 31, 1865. (See Levi Goodell) Sarah died on August 28, 1928 at the home of her daughter Mrs. Jesse (Edith) Phleger in Rutland, IA. Otis Ray Goodell (1878 – 1960) – Otis Ray Goodell, son of Levi and Sarah (Fielding) Goodell, was born on January 8, 1878, in Mansfield, Illinois. He married Musa Maud Sherman on February 27, 1901. They had four children. He farmed for several years, and then engaged in the livestock business until 1924. The family then moved to a farm near Primghar, Iowa and farmed for nine years. In 1933 he moved to Primghar, Ray engaged in monument sales and was custodian of the Primghar cemetery for 23 years, retiring in 1956. Ray held various offices in the town of Rutland and served on the school board. He was an active member of the Methodist Church. He taught Sunday school, was Sunday School Superintendent and served on the official board of the Church. Otis Ray Goodell died on October 14, 1960. Bob Krepps © 2002 all rights reserved. Permission granted to copy for personal & non-commercial purposes only. Goodell Family History, an account written by Sarah Ann Fielding Goodell is the source for much of the information and quotes from the letters of James Fielding. Most of the information is from a brief autobiographical account written by S. W. Ingham when he was eighty-six. Goodell Familly History, an account written by Sarah Ann Fielding Goodell is the main source of information for this sketch of her father, Jesse Fielding. Archivist, Dakotas Conference of the United Methodist Church provided significant information on the life of Septimus W. Ingham. Goodell Family History, and account written by Sarah Ann Fielding Goodell, Bethel Church still exists 4 miles southwest of Mansfield, IL in Piatt County. Sarah and Levi were charter members.